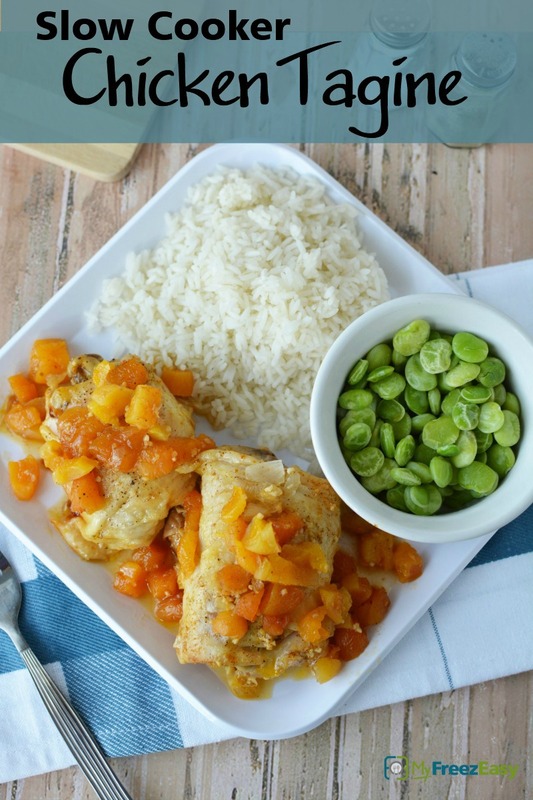 This tagine (tay-geen) sauce is amazing - it’s a lovely balance of sweet and savory and is best with chicken thighs (but chicken breasts or tenderloins would work too!) I love how the chicken thighs add that extra depth of flavor from the darker meat. You could also mix some white and dark meat - that would be great with this sauce too. Let the slow cooker do all the hard work and you get to enjoy a fun, delicious meal at the end of a hard day! Finely chop the onion. Chop the dried apricots. In a small mixing bowl, mix together the chopped onion, minced garlic, ground cumin, paprika, ground ginger, chicken stock, honey and chopped apricots. Place the chicken thighs into the base of the slow cooker and season with salt and pepper. Pour the apricot mixture over the chicken. Set on low and cook for 8 hours. Strain off excess liquid and serve chicken with sauce. 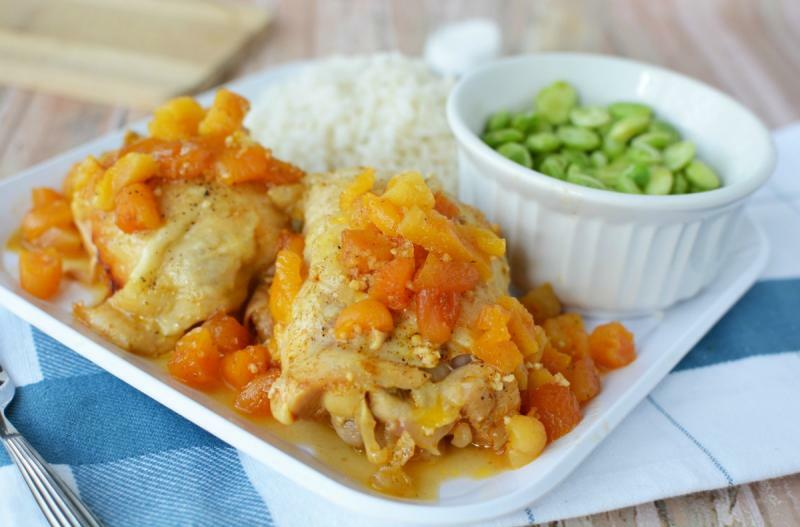 Serve Slow Cooker Chicken Tangine with rice and veggies. Finely chop 2 small white onions. Chop 2 cups dried apricots. In a small mixing bowl, mix together the chopped onion, 4 tsp minced garlic, 2 tsp ground cumin, 2 tsp paprika, 2 tsp ground ginger, 2 cups chicken stock, 2 Tbsp honey and chopped apricots. Put baggie in the freezer and freeze up to 6 months in fridge freezer or 12 months in a deep freezer. Thaw in the fridge overnight, or a warm bowl of water for about 20 minutes, before transferring all of the contents of the baggie into slow cooker insert. Set on low and cook for 8 hours. Recipe is gluten-free when served with gluten-free sides like rice or quinoa. Thaw and add contents of baggie to slow cooker. Set on low and cook for 8 hours. Strain excess liquid and serve with sauce.